Throughout his army career, Milburn fought in World War I in the Panama Canal Zone and in the 5th, 15th, 28th, and 33rd regiments, in World War II as the commander of the 83rd Infantry Division, and in the Korean War as the commander of the IX Corps and in many other positions. A native of Jasper, Indiana, Frank W. Milburn was born in January of 1892. In 1914, while he was attending the United States Military Academy at West Point, he was commissioned in the infantry as a lieutenant to serve in World War I. After the war, Milburn attended the Command and General Staff School, a school for Battalion and Brigade commands in the U.S. Army, and graduated in 1933. He was later promoted to Brigadier and commanded the U.S. 83rd Infantry Division in 1942. His contributions to the war effort resulted in another promotion, to the Major General rank. Because of his experience in combat during World War I, he gained a distinct reputation that followed him after the war and into World War II. Serving as a United States Army Combat Corps Commander during World War II, Milburn was one of the thirty-four highest-ranking officials, who not only concentrated on high-level strategies and tactics, but also engaged in battles at the front. However, unlike the majority of the commanders, Milburn and a few others didn't serve on the front, in France and Siberia, during World War I. Instead, Milburn served in the Canal Zone in Panama. Despite his inexperience in direct combat in the previous war, the experience "did not prove to be critical for future advancement and selection of high-level command...during World War II" (Berlin). 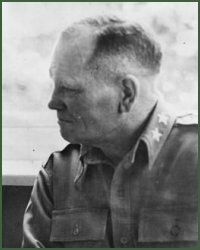 Major General Milburn served as a commander for the U.S. 83rd Infantry Division from August 1942 to December 1943, succeeding Major General Robert C. Macon. They participated in campaigns in Normandy, northern France, the Rhineland, Ardennes-Alsace, and central Europe. Later, after serving as the commander of the 83rd Division, he also served as commander of the XXI Corps, the V Corps, and the 1st Division. Milburn's career in the Army is noted for his command in five different army corps of the U.S. Army. Furthermore, all of his military accomplishments made him a decorated hero. By the end of his military career, Milburn had earned two Distinguished Service Medals, two Silver Service Awards, the Legion of Merit, and the Bronze Star. He retired in 1952 after serving in three major wars and thirty-eight years of service. After his retirement from the Army, Milburn served as the football and basketball coach at Montana State University in Bozeman, Montana. At the age of 70, after a lifetime of service, Frank William Milburn died in Missoula, Montana in 1962 and now rests at the Fort Missoula Cemetery. Berlin, Robert, H. U.S. Army World War II Corps Commanders. Fort Leavenworth, Command and General Staff College, 1989.